Chances are, the beating heart of your Ducati and, for that matter, every other desmo you’ve seen out on the road, was assembled, at least in part, by women. 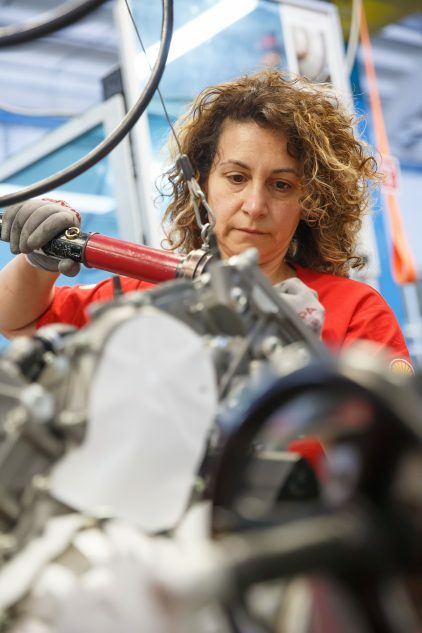 Making up 14% of Ducati’s production line in the Borgo Panigale facility, are women. The vast majority of that number is stationed on the engine assembly line, putting together the most crucial components of any Ducati motorcycle. This past February I found myself in the somewhat sleepy district of Bologna which has been home to Ducati’s facility since 1935. I was invited to have a look behind the scenes at the design process of the new Ducati Diavel, an interesting experience you can read about here, but I was also given the opportunity to interview Claudio Domenicali as well as having my own private walking tour of the production facility with Ducati’s PR manager, Giulio Fabbri. During the tour I was able to meet and chat – with Giulio’s help, of course – with some of the women that make help bring to life each Ducati motorcycle. Women’s employment rate in Italy is at more than a ten year high with a recorded 52.5% in 2017. 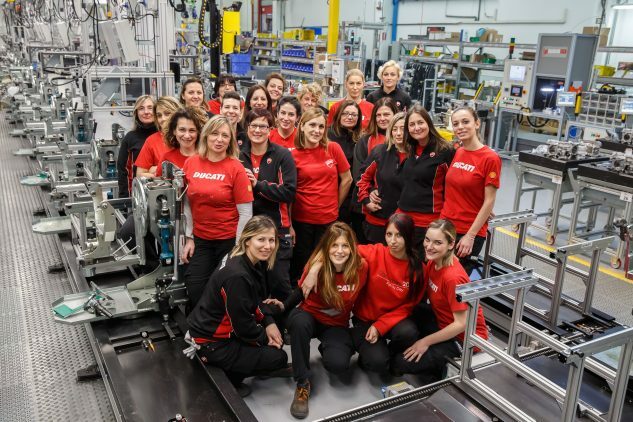 While women make up 14% of Ducati’s production line, 228 of the entire facility’s 1,236 employees are female, bringing the overall percentage of women to 18%. Italy also boasts one of the lowest gender pay gaps at 5.3% in the EU and has been on a decline over the past few years. Of the women we met on the line, some were born in Bologna and proud of it while others made the move to work for Ducati specifically. All were vibrant, passionate, and dedicated people who enjoyed their jobs and appreciated where they work. Having the chance to discuss with these women even the most basic small talk like who their favorite MotoGP rider was, was an experience I won’t soon forget. Let’s take a look at a snapshot glance of some of the women I met while touring the facility. Catia is in charge of the Scrambler “Marketplace,” the area where all the parts are housed for each engine assembly line worker to come and pick the number of parts they need in order to do their portion of assembly. At 56 years of age, Catia has spent 30 of those years with Ducati. As would become apparent later, Catia, like so many others, has a soft spot for Casey Stoner. Originally from Romania, Cristina moved to Italy nine years ago. 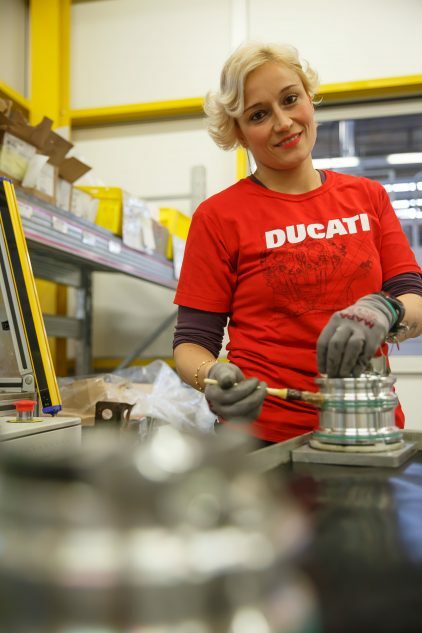 Seven of her nine years in Italy, have been working at Ducati. She initially worked on the engine production line yet now has her own relatively quiet “office” – a big sterile glass box – where she prepares the crankshafts for later assembly into the engines. I think I saw a single tear drop from Giulio’s expressionless face as Cristina told me she was a fan of Marc Marquez. 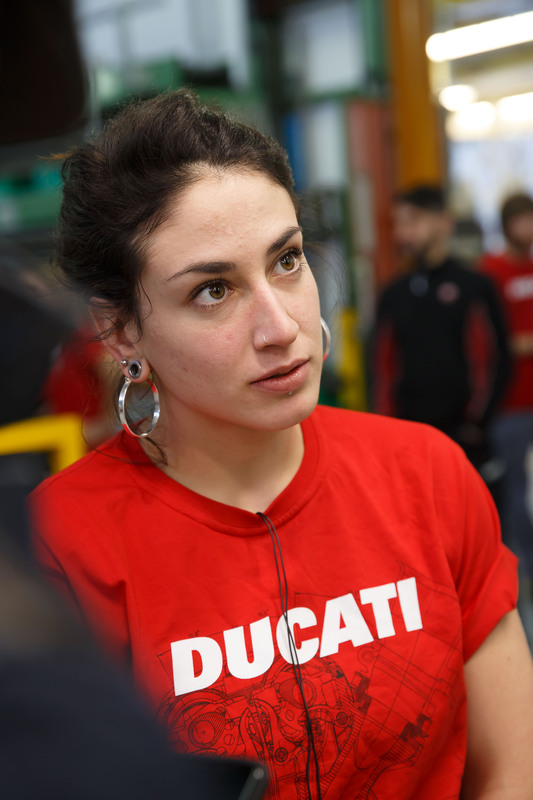 Ilaria, at 22 years of age, is the youngest women we interviewed and has been working for Ducati for the past three years, two of which have been on the new V4 motors. 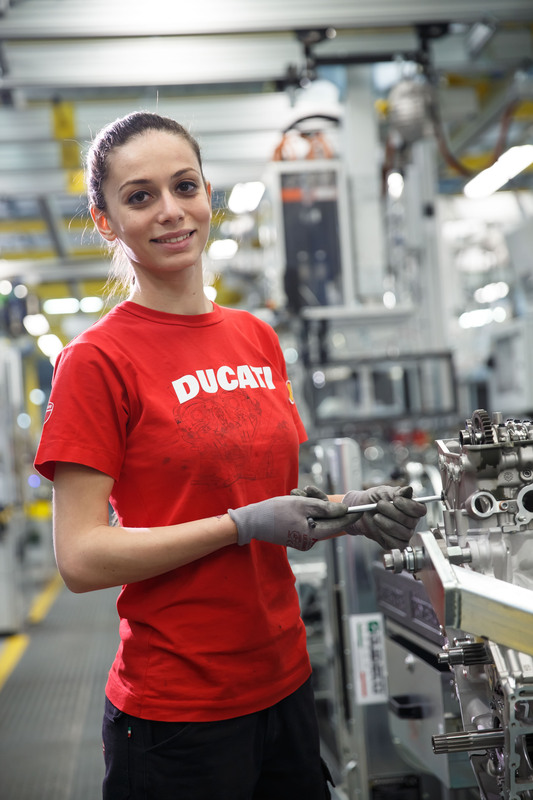 She made the move from her home in Naples to Bologna to work for Ducati. Ilaria’s passion for building Ducati engines gives her a deeper sense of satisfaction, one that stems from the emotion the machines evoke in their riders. As a child, Ilaria worked on bicycles with her cousins and said this is where her interest in building and fixing things began. Though she studied an entirely different subject in tertiary school, she’s very happy to be working on the Panigale V4 engines. A big race fan, Ilaria met all of the MotoGP racers from the 2018 season, but says she’s particularly fond of Dovizioso. When asked if she rides, Ilaria told us she plans to get her motorcycle license soon and hopes to get a Monster 797, with her dream bike being the Panigale V4. Sabrina is an absolute firecracker of a woman. Laughing and joking throughout the entire interview, at one point she points down to the stain on her shirt and says that she, “makes love to the engines.” Now a supervisor for liquid-cooled four-valve engine production lines, she teaches young workers how to build these engines. Her current student says she’s like a drill sergeant, a sentiment that Sabrina agrees with, but is quick to point out that he’ll be trained fully in a matter of days. She’s been with Ducati in various of roles over the past seven years. After being asked about whether or not she rides a motorcycle herself, she explained to us that her husband just tells her to buy a scooter, but for her, it’s a Ducati or nothing at all. I asked Sabrina why there are so many women in the production line and she told me because the women were faster and more precise, naturally. 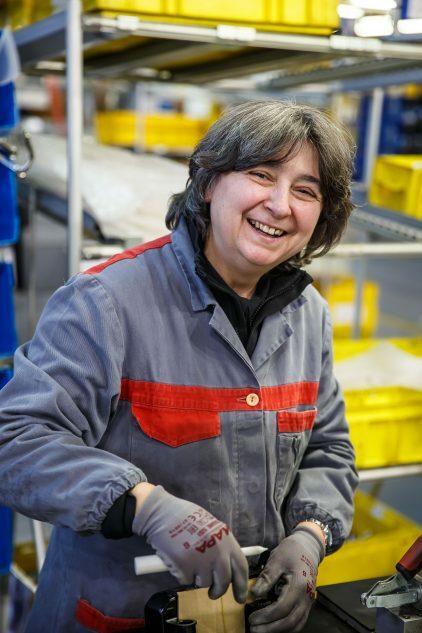 Angela has spent the last 18 years working on the Ducati engine assembly line, prior to putting together Ducati motors, she was assembling Minarelli engines in its Bologna facility. While she admits that when she was first hired it was simply to have a job, she’s begun to really enjoy the aspect of watching something being born. A passionate racing fan, Angela’s two favorite racers were easy to guess: Stoner and Dovi. Angela is currently working on the newest engine production line, the Panigale V4. Alessandra celebrated her 12 year anniversary just days before my visit. Previously working on the line, she now has her own glass box in pre-assembly working with cylinder sleeves. She’s proud to say she was born in Bologna, while her parents and brother were all born in Naples before the family moved. Alessandra echoed the same belief as Sabrina when asked why there were so many women in these roles, because they’re more precise and have smaller hands. As a child Alessandra had aspirations of owning two motorcycles, a small one for commuting and a bigger bike for touring, now that she is 34, she says that it’s too late for her. She said she honestly doesn’t know of many women in the production facility who do ride. She’s a big Valentino Rossi fan, but is currently rooting for Dovi. To be honest, I felt kind of bad for hunting Lia down the way we did. After so many girls told us their aspirations of riding and owning a Ducati, Giulio was on a mission to find one of the girls in production who rode, and that’s how we found Lia. It would turn out that Lia and another girl were the only two anyone could think of that owned their own motorcycle and rode regularly. Lia’s hopes of working at Ducati began in high school, and at the ripe young age of 18, she got herself a job working in engine production, first on the Monster engine and now, five years later, on the Multistrada. Her ride is a 2001 Ducati Monster 600, a bike that her father had a bad accident on, which has since driven him away from riding. Lia enjoys building engines because she knows first hand the excitement that they bring people. The post A Precise Feminine Touch: The Women of Ducati’s Bologna Factory appeared first on Motorcycle.com.